Pretzel Logic's Market Charts and Analysis: US Dollar Update: More Upside for the Dollar? 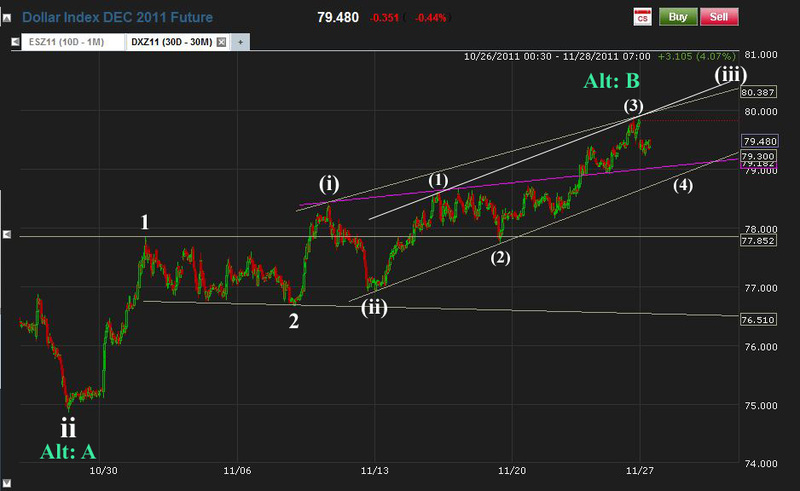 US Dollar Update: More Upside for the Dollar? This is a quick dollar update, since so many markets are tied to the dollar right now. The dollar appears to have completed a five wave sequence on Friday, to wrap up wave (3). It is now due to correct down toward the 78.880-78.925 level in wave (4). In a perfect world, dollar bulls would see a rally develop from this zone, which would carry the dollar up toward the 80.5-81 level. The critical level to watch is the wave (1) high at 78.605 -- a break there would indicate something else is going on. A break of 77.840 would be a fatal blow to the preferred count, and would indicate the alternate count was likely to be unfolding, which would see the dollar attempt a retest of the recent lows at the wave ii/Alt: A label. The preferred count agrees with the current equity market counts, which indicate a correction is due for both markets. For equities, that means a brief rally, and for the dollar, a brief decline. The dollar will hopefully provide some early warning if the equities rally is to become more than a correction -- but currently, there is nothing to indicate any medium or long term trend changes in either market. Trade safe. But yeah, let's continue everything on the SPX thread.